The buzz around town in Manchester, New Hampshire, is about the popular show "COPS" filming in the city, but the first night of filming has turned into the crew's last. 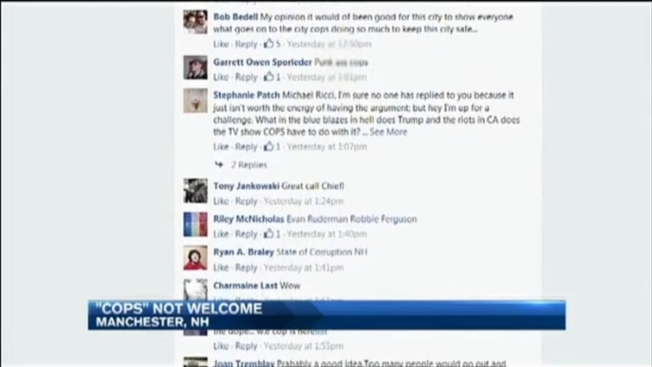 Manchester Chief Nick Willard discontinued participation with "COPS" after he says he heard too many concerns from residents and business owners that the filming would give his city a bad name. When a photo showing a film crew riding along with police Friday night hit Facebook feeds across Manchester, opinions started flying. "A lot of people were sharing it," said resident Ethan Moorhouse. Some people say they liked the idea of having their city featured. "By bringing it out in the open, it shines a light on things going on," said longtime Manchester resident Chrissy Simonds. But according to hundreds of comments on the Facebook page Manchester Information, the majority of people wanted "COPS" to go home. "Having cops here is giving Manchester a bad vibe," Moorhouse said. James Crawford agreed, saying, "That's just the way of nature, you don't want to show your worst side." In response to concerns like that, Chief Willard sent a letter to Mayor Gatsas and city leaders Sunday, telling them he had pulled the plug on filming. "MPD officers are the epitome of true American law enforcement so to showcase them was my intent... However, I have since heard from many in the community... who have expressed concern that the show would have a negative impact on the city's image, which is the very last thing I would want," Willard wrote. "It's the Chief listening to residents and trying to do the best thing he can for Manchester," said another resident Dan Legallo. "It's really showing that he actually cares about the city and not that it is just going to get publicity for them," Moorhouse said. Mayor Gatsas tells necn he supports the chief's decision to stop filming. "COPS"producers have not yet returned our calls for comment. "COPS" aired its first episode in 1989.